Situated in the unspoilt beauty of the natural wilderness some 60 kms south of the arctic circle lies Finland's premier ski resort of Ruka. Ruka has guaranteed snow from October to May offering some excellent skiing on well-groomed and uncrowded pistes. There are 24km of slopes on offer from skiers and snowboarders across 34 slopes of varying abilities. Cross country skiers will relish the challenge of trying to cover the total of 260kms of trails amounst fantastic scenery. In the early season, days are shorter but morre skiing is possible until 7pm as 30 out of the 34 slopes are floodlit and this is great fun. When the sun goes down, it is not pitch black as you will experiance the atmospheric blue polar light and if you are lucky, catch a glimpse of the amazing northern lights(mainly between December and February). Later in the season, days are longer than in central Europe with lots of sunshine. When it comes to having a good time, the Finns are no slouches and Apres ski is always a lively affair, with plenty of music. There are plenty of resturants and mountain cafes in Ruka for a mix of tastes, including pizzerias, fast food restaurants, high class a la carte, european cuisine, sushi and local products.The Piste is an excellent choice to sample local dishes and Royal Ruka has a great selection at a reasonable price. The popular apres venues are Piste, Zone, Colorado Bar and TelluNight, at Zone you can even dance on the tables! Learn the technique of telemark skiing or take part in the activities organised by the local nature and adventure team. You can try a snowmobile safari across the frozen lakes and through the forests, reindeer safaris, husky dog sledding, ice fishing or even visit Santa Claus. The Ruka Club complex has a gym, four squash courts, indoor tennis and badminton, a golf simulator, saunas, Jacuzzis, solariums and a nursery. The nearby Kuusamo Tropikki has a fantastic range of pools and whirlpools to help relax any aching muscles. Iglu Ski has a range of ski holidays in Ruka, Finland. Most ski holidays are tailor-made so speak to one of our Finland ski experts and we can put together a package suitable for your needs. Ruka Suites are located in the centre of the resort, close to the ski lifts. 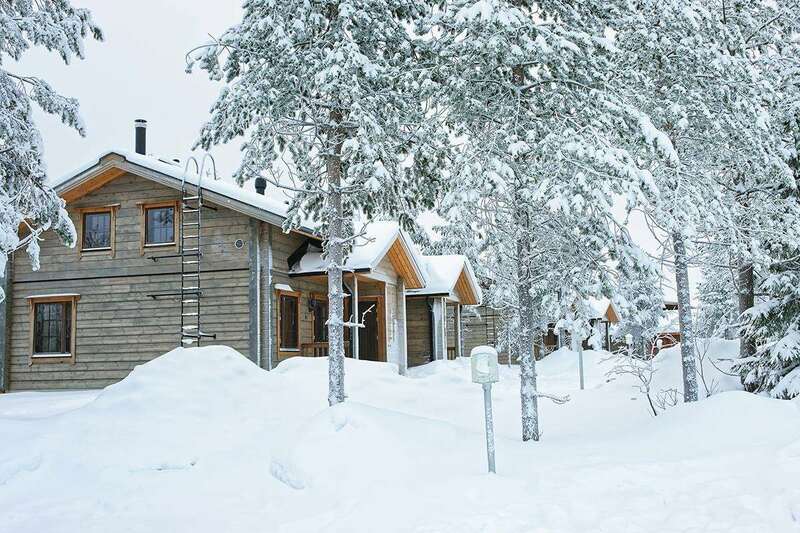 Ruka Log Cabins are an idyllic accommodation for a ski holiday in this Finnish wonderland. Ruka Village Ski Inn Hotel is one of the best properties in the resorts and has a choice of B&B suits or self-catering apartments.